‘Every season in the hills has an essence of its own, one as beautiful as the other’, I remember our porter saying, as he hauled our luggage off the sidewalk of Gangtok’s tidy Mall Road. Monsoon was slowly descending upon the land of Sikkim, making its way up from the South. Our arrival was veiled in a haze of white, reducing visibility to a few hundred metres. In the hills, it’s difficult to tell apart fog from mist and mist from clouds. 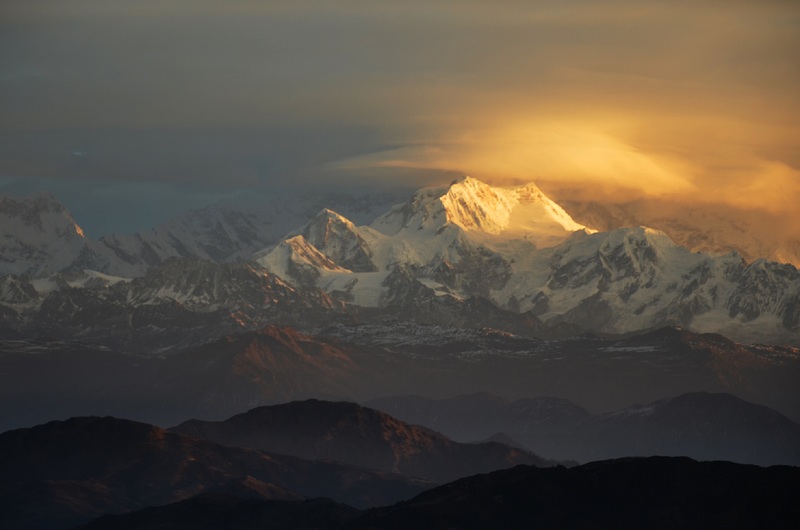 Our slight disheartenment at not being welcomed to the sight of the majestic Kanchenjunga, was understood by Ashish and addressed in the form of these priceless words. It wasn’t a sales pitch. If it was, he would have stared into our eyes with an unconvincing, even sinister smile. Instead, he was looking around, slightly incoherent, slightly lost, as if basking in the truth of what he had just said. And in that instance, he made me realise the core fallacy in our way of understanding people. We stop at words without delving into the nuances of it. Our ideas of beauty and contentment are restricted to binaries, ignorant of the infinity that exists beyond. More often than not, travellers have a habit of preparing a thorough itinerary of the place they’re about to visit. We know exactly what to see and what not to, even though all we know of the place is stories from strangers or figments from friends. This very concept is ironical. And had it not been for Uttam, our driver for the trip, I never would have understood it. The road to Lachen is riddled with waterfalls, the most famous being the Amitabh Bachchan and the Naga waterfalls. Uttam, on the other hand, stopped just for a while at those sites; barely enough to let us take pictures, and urged us ahead. An hour later, we stopped at a waterfall so high and stepped that it took our breath away. There were no cars parked around it, no travellers fumbling with their high-end cameras. I asked Uttam,’ What is its name?’, and he replied,’There isn’t one.’ I remember standing there for more than fifteen minutes, undoing my understanding of life, feeling almost sorry for the people whose itineraries were already ticked off. I thought about the human way of describing people with known adjectives like smart or pretty or reticent or shy, never caring enough to discover the unnamed wonders flowing inside them. We stopped at a market a thousand feet below Lachen. Uttam rushed into the Mandi and half an hour later, came running back with a huge sack of okra and a chicken wrapped in a newspaper, still warm and moist. Before we could ask him anything, he answered our puzzled expressions thus,’ Lachen is a village and its altitude isn’t conducive enough to grow vegetables or rear poultry. So whenever we bring travellers up there, we coordinate with the hotels and the local people and buy the things they’d need for the monsoon or winters.’ He made me feel small, inferior about the way people like us conduct themselves. When do we ever stop and think about what others need? If not in kind, then at least in person? ‘A system only works when the ones involved want it to.’: Too preachy for a woman who runs a grocery store? I guess not. Who are we to decide which humans are entitled to wisdom and which are not? Over the course of the six days that I stayed in Sikkim, not once did I hear the bellowing of car horns, roads were devoid of litter, plastics were non-existent and vegetables were organic. No matter how remote the village or how hidden the household, people obliged to their rules. Creatures of the city seem to have forgotten the tunes of harmony. Rules feel like stains smeared on our egos that we desperately need to wash off, even if it pollutes our homes in turn. Priya aunty is the mascot we desperately need, the grocer at every corner of our lanes. Now that a month has passed since I returned, I try to remember the things that affected me the most. And as much as I strain my memory for lakes and hills and view-points, it’s the people and their words that seem to have touched a part of me that I did not know existed. We think we fit into a sweater woven in thick wool, but the truth lies in the fact that we can pull it apart to weave something entirely new and beautiful. Something that challenges the conventions that shroud us.